Australian industry warns of an explosion in costs associated with the Renewable Energy Target using intermittent solar and wind generation, an explosion which was always going to happen with the silly schemes implemented by successive governments. Greg Combet's office said that major electricity users are partly shielded from RET costs without stating the corollary that the poorest consumers are hit with the total cost. It is an encouraging sign that more and more critical articles on the "clean energy" fiasco are being published in the MSM. The Queensland government has called on the independent Productivity Commission to investigate renewable power subsidies after claims from the biggest power generator that solar does not reduce emissions at all . You would guess that the Stanwell power station people would know what emissions they are generating but apparently Greg Combet and his Climate Change Charlatans know better and would never let their bodgie calculations be independently verified. Apparently Renewable Energy Certificates "were not calculated wrt carbon dioxide emissions" says a spokesman for the Minister which is quite incredible as I thought that was the purpose of the whole multi-billion dollar waste of tax-payer funds. THE Productivity Commission should examine the cost and environmental benefits of the Renewable Energy Target and the amount of carbon emissions actually saved, the Queensland government has said. It was critical renewable energy projects delivered emissions savings to justify their cost, Queensland Energy Minister Mark McArdle said in a letter to Climate Change Minister Greg Combet. Stanwell Corporation, the state's biggest power utility, has said the boom in rooftop solar installations has not resulted in any carbon emissions savings. "There is some evidence to suggest the unreliable nature of renewable energy has resulted in coal-fired electricity generation to be maintained at pre-RET levels and claims carbon abatement inflated by the federal government to justify its commitment to renewable energy," Mr McArdle said. But a spokesman for Mr Combet said last night: "Renewable Energy Certificates were not calculated with respect to carbon dioxide emissions." Emissions reduction estimates were derived by either "modelling, by external consultants or in-house calculations by the Department, or a combination of these approaches". RECs are issued for each megawatt hour of electricity generated. Small-scale installations, such as rooftop solar, are supported by the Small-Scale Renewable Energy Scheme. Mr Combet ruled out a PC probe and said the government had legislated a thorough review of the operation of the RET by the Climate Change Authority. "The government rejects views put forward by climate sceptics designed to undermine our transformation to clean energy sources," a spokesman said. He said the government was "committed to ensuring renewable energy plays a big part in our clean energy future through the carbon price, Renewable Energy Target, Clean Energy Finance Corporation and Australian Renewable Energy Agency". The spokesman said the government was confident in the accounting that underpinned both the carbon tax and the RET. Carbon emissions savings would be achieved through a combination of the RET and the carbon price, he said. In a submission to a senate inquiry into electricity prices, the Newman government has highlighted the hidden network costs of rooftop solar. Stanwell has now openly questioned the environmental benefits of the rooftop solar rollout. This was because generation of solar electricity did not automatically reduce carbon emissions at base load power stations. Coal-fired power stations are designed to run most efficiently at full capacity, a Stanwell spokesman said. "Reducing the amount of coal burnt made them more inefficient and increased the carbon intensity of the electricity produced," the spokesman said. This cancelled out any benefit of Queensland's 400 megawatts of rooftop solar, which did not produce electricity at times of peak demand. Financially, the situation was made worse for power utilities because annual fuel costs were fixed. The fixed cost of producing less electricity from coal was passed on to consumers who were then forced to subsidise rooftop solar panels for the theoretical carbon savings that were not actually being made. Mr Merritt said rooftop solar was a curse for big power utilities because "your two cheapest forms of generation are being displaced by the most expensive". 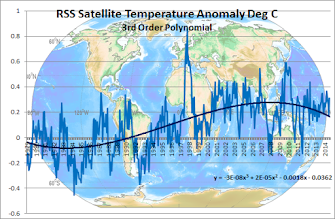 In a routine rally-the-grant-money doom-and-gloom statement the CSIRO says that by 2030 climate change will start transforming our landscapes and by 2070 profound changes will occur and our "grandchildren" could live in a different country. With a liberal use of the weasel words "could,may and might" and "is likely" the release is careful to set climate armageddon far enough away not to cause the embarrassment of time catching up with the BS as it did with the 10 year death of snow prediction. 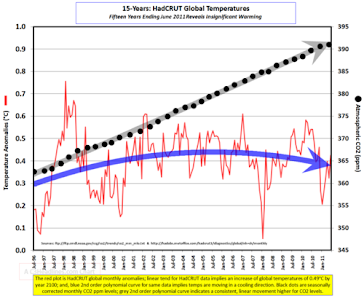 Of course it is all true because the computer models say it is - the same computer models predicting rampant warming with the epic fail results shown below. When you wake up 4 years later you may be forgiven in thinking you have been living in a time warp. The only thing that should change is that Americans may wake up to the con and boot him out. Canberrra: The carbon tax police prepare to move into their plush new offices and are looking for "23 fridges, 14 dishwashers, 26 microwaves, two ovens, two cooktops, two wall-mounted rangehoods and a 40-bottle wine cabinet with a glass and stainless-steel front . But the government insists the energy efficiency of the building will save taxpayers money in the long run." Yeah right! Climate Scam Minister Combet says they may reconsider the wine cooler - I guess 40 bottles may be on the light side ! Adelaide: In contrast to the Canberra snouters more than 10000 have had power disconnected as they are unable to pay escalating energy costs .No plush offices or wine coolers for these people - no power either! Soaring power prices are being blamed for this 38 per cent spike in disconnections, with welfare groups reporting those on fixed incomes suffering the most - including one man who had to resort to cooking his meals over a wood fire in his back-yard for six months after being disconnected. Welfare agency Anglicare said it had reports of disconnected households commonly using candles for lighting, heating rooms with barbecues - and keeping perishables such as milk and butter in Eskies. South Australian Labor continually bleats about how much cheap wind-power they are generating but in the end it is the consumer who pays as part of the global warmist plan that says "electricity rates would necessarily skyrocket " to use the words of the Warmist-in-Chief Obama . Maoris in New Zealand are claiming rights over the wind which is a Maori deity and say that it should not be used without Maori consent. Of course this is completely silly as everyone knows Gaia is in charge of the wind and this claim could give rise to a major demarcation dispute between deities with the Sun God already upset over scientist's denial of his effect on the world's climate.The Global Warming Church has made a statement on the crisis saying "it is much worse than we thought" . A Maori claim for the use of wind will stretch non-Maori good will to breaking point, ACT leader John Banks says. Ngapuhi elder David Rankin represents a group of hapu which plans to take a claim to the Waitangi Tribunal. It wants a pan-tribal body to manage shares in commercial wind-generated electricity, and to hold a casting vote on where wind turbines can be located. "Ngapuhi's claim defies common sense and will greatly damage relations between Maori and non-Maori New Zealanders," Mr Banks said. "Its attempt to claim rights over the wind will push many New Zealanders' good will to breaking point." Mr Rankin says traditionally the wind was regarded as a deity in Maori society, and Maori do not consider the Crown has the right to use it without Maori consent. Prime Minister John Key has dismissed his comments and says he doesn't believe there's any basis for the claim. "My view is pretty clear: no one owns water, no one owns wind, no one owns sunlight, no one owns the sea. I could give you quite a long list if you like," he told media. Mr Rankin says the Maori Council's claim over water rights sets a precedent. The latest Newpoll has Labor dropping 2 points to 33% but the big news is the erosion of the Green's vote ,down 3 points to 8% showing the new leader Christine Milne has failed to inspire. Over the past year Green support has hovered around 12% so this fall is significant.The Coalition still holds a commanding 55/45 lead two-party preferred which would translate to a Labor massacre in an election. The Coalition retains a clear, election-winning lead in the polls; Ms Gillard and Mr Abbott remain personally unpopular and locked together in a debilitating contest to be the preferred prime minister. The only significant change is in support for the Greens, which under the new leadership of Christine Milne has fallen to a 3 1/2-year low. For the first time since early 2010, the Greens' primary vote is in single digits and at 8 per cent is at the lowest Greens' level in a Newspoll survey since March 2009. Voters nominating "others" they would vote for first jumped four percentage points to 13 per cent. According to the latest Newspoll survey, conducted exclusively for The Australian last weekend, Labor's primary vote, after a seven-point rise during July and last month, has dropped to 33 per cent from 35 per cent two weeks ago and the Coalition's primary vote is up one point to 46 per cent. Based on preference flows at the 2010 election, the Coalition holds a 10-point, election-winning lead of 55 per cent to 45 per cent on a two-party-preferred basis compared with 53 per cent to 47 per cent two weeks ago.